The Supreme Court on Friday rejected a special appeal by lawyers for Aum Shinrikyo founder Shoko Asahara, finalizing the death sentence for the man who masterminded the cult’s horrific nerve gas attack on the Tokyo subway system in 1995. The top court’s Third Petty Bench, led by Justice Yukio Horigome, affirmed that Asahara, who is nearly blind and incapable of communicating with his lawyers, is legally sane and can thus be held responsible for his actions. The decision, which is likely to generate legal controversy, concludes the trial of the 51-year-old mass murderer, which has dragged on for more than a decade. Asahara’s defense team protested the ruling in a statement released Friday night. “The content is lax and not sincere. It is extremely slanted. We protest it strongly,” the statement said. Asahara was sentenced to death in 2004 for his role in 13 crimes, including the shocking attack on the subway system, which killed 12 people and injured some 5,500. 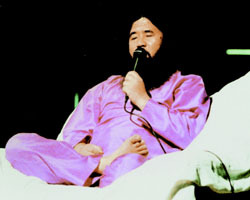 His first appeal was made in May to the Tokyo High Court, which dismissed it after saying the guru’s attorneys deliberately missed a deadline for justifying the appeal because they were unsatisfied with the results of a court-commissioned psychiatric examination that found the debilitated guru competent to stand trial. His defense team then filed a special appeal in June, asking the Supreme Court to overturn the high court’s dismissal. The Supreme Court upheld the lower court ruling and rejected the defense’s argument that the psychological exam that found him mentally competent was flawed. “The defendant has not tried to communicate with his lawyers, and that caused this situation. The defendant as well as the lawyers are responsible” for the delay, Horigome said. The decision by the top court affirms that Asahara is legally sane and was responsible for his actions. The founder of Aum Shinrikyo, whose real name is Chizuo Matsumoto, was arrested in May 1995, two months after ordering cult members to release the nerve gas into Tokyo subway trains. Aum Shinrikyo changed its name into Aleph in 2000. 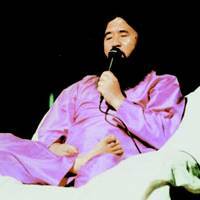 His arrest was broadcasted live on TV as riot police raided an Aum facility in Yamanashi Prefecture where the guru was found hiding in a hollowed-out wall. In February 2004, the Tokyo District Court found Asahara guilty of 13 criminal counts, including the deadly poisonings of the subways, another sarin attack in Nagano Prefecture, the murder of a lawyer who had fought against the cult and his family, and other slayings. He was sentenced to hang, and his lawyers appealed to the high court the same day of the verdict. However, the defense team missed the deadline in August 2005 to submit its reasons for the appeal, saying they were unable to communicate with Asahara. To show why they missed the deadline, the team submitted results of examinations of Asahara by six psychiatrists. Last March, the high court upheld the lower court’s verdict that Asahara would hang. His lawyers objected to the high court ruling and insisted that Asahara, who is almost completely blind, was experiencing a psychological disorder and was incompetent to face the high court. But the high court once again dismissed the defense counsel’s protest in May, claiming Asahara’s symptoms were merely a reaction to being locked up for more than a decade. The defense team opted to file the special appeal to the Supreme Court seeking a review of that pronouncement. The lawyers claimed in the special appeal there were unavoidable reasons for the belated submission and that Asahara should not be held responsible for them missing the deadline. They also disputed that Asahara was competent to stand trial. Takeshi Tsuchimoto, a professor at Hakuoh University Law School and a former attorney with the Supreme Prosecutor’s office, said that Friday’s decision was to be expected, considering the course of the proceedings so far. The major unanswered question, Tsuchimoto said, is how Asahara himself views the murders. “All of his disciples made statements in court, but the ringleader has never said anything about what happened or what he made (his disciples) do. “For the Japanese people, this has only left a feeling of total emptiness,” he said. Other analysts said the arguments would have had to have been much stronger to succeed because the high court had already rejected them twice. Special appeals rarely end in reversal, with only six of 2,689 so far having been accepted by the Supreme Court in the last decade. However, Asahara’s sanity remained debatable as the six psychiatrists deemed the guru “unable to communicate” and incompetent to stand trial. A court-appointed psychiatrist, on the other hand, claimed the contrary. According to his lawyers, Asahara’s behavior had grown erratic during his 11 years of incarceration — he was often heard shouting obscenities and he masturbated during meetings with lawyers and psychiatrists. Had the Supreme Court accepted the special appeal, it would have presented the possibility of the high court reopening it or of the trial being canceled due to the defendant’s inability to be tried. In a written statement released Friday, Aleph said that it again offers its deepest condolences and apologies to the victims of the cult’s attacks and their families. The group added that it will continue its sincere efforts to pay damages to the victims as quickly as possible. It pledged to work with bankruptcy administrators, the victims and the local community to make Aleph an accepted part of society.